Many people who exercise consistently and follow a healthy diet are still frustrated by loose skin, pockets of fat, and a belly bulge. While fitness is important, often the effects of pregnancy, weight changes, the aging process, and multiple abdominal surgeries won’t go away without surgery. Board‐certified plastic surgeon Dr. Michael S. Beckenstein performs abdominoplasty, often called a tummy tuck, to help his patients in Birmingham, AL have firmer, flatter contours. If you would like to meet with Dr. Beckenstein in Birmingham and find out if a tummy tuck can give you the improvements you want, please request your comprehensive consultation online or feel free to speak with an office associate at (205) 933-9308. Pregnancy: Women who have had children can develop abdominal wall laxity, known as diastasis, when the abdominal wall is stretched by the developing baby. After childbirth, for many women the abdominal wall remains stretched and does not return to its pre‐pregnancy tightness, even with targeted exercise and dieting. Significant weight changes: Men and women who have lost large amounts of weight or have had multiple abdominal surgeries are often left with extra skin and a belly bulge. Excess fat can accentuate this lower abdominal fullness. When you visit Dr. Beckenstein for your consultation, he will perform a physical exam, talk with you about your concerns, and educate you about your options. He will then develop a surgical plan to fit your needs and aesthetic goals. Dr. Beckenstein informs all his patients during their consultations that a tummy tuck is one of his favorite procedures to perform because, as his patients have said, “the improvements are so dramatic.” An abdominoplasty can significantly transform both your look and your life. Mini‐abdominoplasty is suited to address a small amount of excess skin and muscle laxity that is located below the belly button (umbilicus). It results in a short scar that is similar to a C‐section scar. Traditional tummy tuck is indicated for excess skin and fat, as well as abdominal wall laxity that extends above the belly button. The main incision is longer than with a mini tummy tuck. This technique requires relocation of the belly button. Extended tummy tuck can be performed if the outer thighs have excess fat and skin laxity. With this technique, Dr. Beckenstein extends the incision of the traditional tummy tuck around to the sides, resulting in more comprehensive recontouring. Circumferential body lift, also called a belt lipectomy, addresses the entire circumference of the lower torso to recontour the abdomen, outer thighs, and gluteal (buttock) regions. It is an extensive procedure that leaves a scar all around the belt area. Sometimes this is performed in stages, as two separate surgeries, for patients after massive weight loss. Board‐certified plastic surgeon Dr. Michael S. Beckenstein performs abdominoplasty for both men and women at select hospitals in and around the Birmingham area. In most cases, he performs the procedure as outpatient surgery using general anesthesia. The incision placement and length depend on the amount of loose skin you have and whether your abdominal muscles need to be repaired. 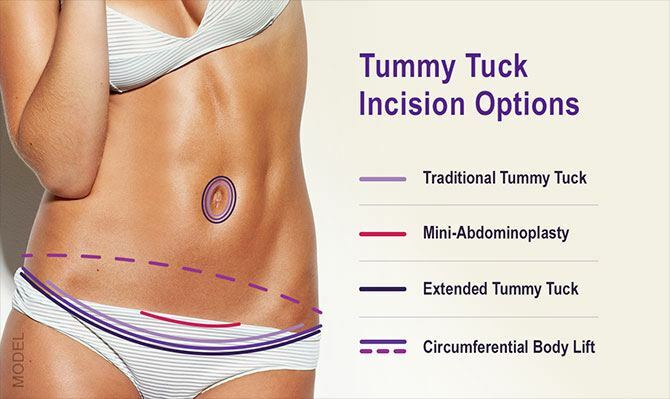 In addition to the main incision, which Dr. Beckenstein places low enough to be covered by underwear and swimsuits, he may create a second incision around your belly button. He lifts the abdominal skin, draws separated abdominal muscles together and stitches them together, then smoothes the skin down, and trims away the excess. He may create a hole for the belly button as well. Finally, he stitches the incisions closed and covers them with surgical tape. Because each surgery is so unique, the cost of a tummy tuck varies greatly. You will be provided with a written estimate during your consultation. By choosing a board‐certified plastic surgeon, certified by the American Board of Plastic Surgery, you can be confident that your procedure will be performed with attention to safety and aesthetics. Remember, experience matters. Can I have liposuction instead of a tummy tuck? If you have a reasonable amount of excess fatty tissue and good skin tone, you might be a good candidate for abdominal liposuction. If you possess excess fatty tissue, skin with stretch marks (poor elasticity), and abdominal wall laxity, a tummy tuck may be the best option for you. Abdominal liposuction is indicated for those with just an excess of fatty tissue. Good skin elasticity and abdominal wall integrity are necessary in order to achieve an appealing result with liposuction alone. I’d also like to have breast enhancement surgery. Is it safe to combine procedures? Abdominoplasty can be performed alone or in conjunction with other cosmetic surgery procedures such as breast enhancement and liposuction. Pregnancy can affect many areas of the body, including the breasts, which is why many women choose to have breast enhancement surgery in addition to a tummy tuck and liposuction. Dr. Beckenstein is experienced in performing these combination procedures, often referred to as mommy makeovers. Is it safe to get pregnant after a tummy tuck? In most cases, it is perfectly safe to become pregnant after having a tummy tuck. However, if you plan to have a baby in the near future, Dr. Beckenstein recommends postponing the surgery until afterward. It is likely pregnancy will stretch out your abdominal muscles and skin, undoing the improvements from your surgery. By waiting until your family is complete, you will make the most of your financial investment and recovery time.